I've had a note in two diarys that I am supposed to have a booking in Chelmsford on the 8th of April. Having spent the morning on the phone trying to track down any group in that area that might be expecting me. Thank you so much to the various ladies who have helped me with this endevour. However after all our efforts we can't find any group who thinks I should be visiting them so I have removed it from my diary. If you are expecting to see me on April 8th 2010, please do get in touch as soon as possible. I am more than happy to be somewhere, but I need to know where. I hope I am now fully up to date with paperwork, forms and booking emails. If you haven't heard from me in the next couple of days and were expecting to I would dtrongly suggest phoning me. My number is on my web site. I say leave a couple of day as a lot of forms are going in the post today so will take a little while to arrive. Having done the boring bit I can get on with the fun part of my job. Quilting. I have a very complex quilt to work on at the moment. Lots of different blocks and applique. Fortunately it is for a regular customer and I've just got to do what I think best, so I will love working on it. There will be a lot of thread and pattern changes thoguh, so it isn't going to be quick. Yesterday I had my regular book class in Purley. I don't know how I manage it but I seem to attract groups of interesting quilters. This bunch are no exception and teaching them is a lot of fun. They like to keep me on my toes though and try and sneak in interesting design features if I turn my back. 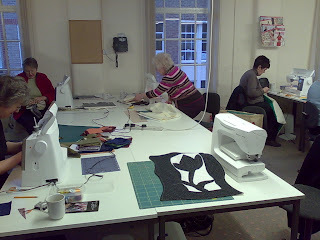 They are making good progress and I am really looking forward to seeing the finished quilts. I was especially pleased that the lady who had felt most behind last lesson has done more than I asked as homework and her quilt looks fantastic. She has also made the back of her quilt more interesting by piecing one of the borders. It does lift the whole thing. I suspect she will come up with other neat ideas as she goes on. If anyone else has finished a quilt from my book 'Ferreting Around' please do send me a picture I find it fascinating what people can do with the designs in it. I would also love to have a web gallery of your quilts, but to do that I first need the pictures. Yay, I can finally tell you what I am up to, I am making garments for the international evening at the Festival of Quilts this year. There is a friendly competition between the Brits and the Russians in the form of a fashion show. I am really looking forward to it as it is quite different for me. I've done plenty of quilting and a lot of dress making but never together. It's given me a great excuse to get on with a couple of projects I had been putting off due to a lack of time. The information for the Festival is now availble at the Twisted Thread web site. Booking for the classes doesn't open until March. One of those days and just what I needed. I've learned quite a few things today. The sidewall of your tyre blowing out is very load when it happens but not that big a deal at 30 mph. After the tyre has blown driving on the rim isn't as noisy as I would have expected. You can definately hear it, but I could believe for a non car nut with a stereo on they might not notice. I have wondered when I have seen people driving on completely flat tyres. I was reminded that most men when passing a female with a sick car will shout abuse. However there are a few decent people out there and I am very grateful to the two people who let me use their mobile phones and to the man who leant me a decent wheel brace. I've aslo learned how frustrating it is when your body lets you down. My knee has been playing up a lot recently and I am finding it very difficult to crouch or kneel. Even harder to get up again. As I couldn't find the key to unlock my wheel covers I didn't manage to get stuck sitting in a puddle next to a broken down car without a mobile phone. I did however get to feel pathetic for not changing my own tyre.I've also found out that my wheel size has become obsolete again. I replaced my 13" rims with 15" rims because no one was making tyres for them. Now they have changed back again to 13". Strange. It also looked like my favourite tyres were no longer available for either size, but after a lot of searching we may have found some, keep your fingers crossed. I returned a silk wholecloth to a customer today. Which was great. It was a stressful project but I thought it looked great when it was done. Silk dupion over wool wadding, just yummy. I have had plans for a while to make me a two layer silk sleeping bag. This has made me more tempted than ever. Finally this was just what I needed to hear today. It has been a long and not terribly sucessful day. I love it when a student can take away something useful from a class. I really don't mind what that is, I do accept that sometimes it will be "this is not for me", but it is nicer when it's something really useful. Even if it wasn't technically what I was teaching :) It also shows it is worth taking your sewing machine instruction book to class with you. Most tutors know a lot of machines but not all of them. One last lesson, black cycle shorts, always black. Ricky's quilt made it back. Ricky has his bag back, complete and intact. He thanks everyone who made a noise about this and made United Airlines take note. They have been speaking to him today and when they actually tried they found it and got it back to him very quickly. It shows that when they want to they really can be quite efficient. Shame it takes this sort of effort to make them want to. Still the quilts made it home, and all is well. Anyone work for United Airlines? Ricky Tims needs a hand getting in touch with a human at United Airlines Chicago. He has had a bag go missing between there and Colorado Springs and well he would REALLY like it back. You can read the whole story here. If you can't help directly maybe you can ask your friends to see if they know someone. I made it back from Pearoom Quilters safely yesterday. It was a lively group and I had a lot of fun there. I am looking forward to getting some pictures of the samples they made in the workshop. It always amazes me how different they all are, even with the same instructions. The 'Fur, feather, scale" class works best with a group who are happy to experiment, and this group really were. It is a class where I aim to teach three techniques. Some people will choose to finish one of more of the samples as wallhangings, others only use them as samples to jog their memory later. Whilst I am quite happy with this, a lot of groups perfer a finished project. 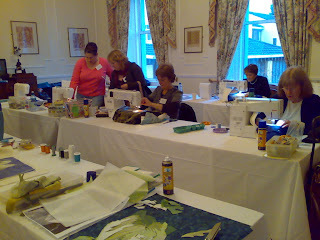 Saturday there were 15 ladies, having fun and they produced some great pieces. I hope they will get in touch if they make a bigger project with any of them. I should have taken the time to get some pictures around Heckington, but somehow it never quite happened. The village has a really nice windmill, and although the landscape is very flat (well what do you expect from fens?) it was rather attractive too. I am always a sucker for clumps of tree and large areas without humans. I also found out that the group too their name from their original meeting place, a pea drying hall. I hadn't thought about how you would dry peas, but I was surprised that they were just laid on the floor of a large hall. To me that seems a very poor use of space, after all peas aren't very tall are they? I would have expected lots of shelves or something. 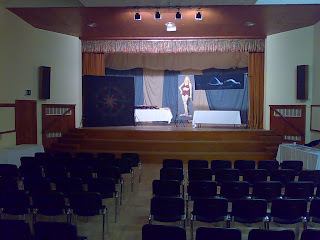 Still it seems that the method they used gave the community a useful resource, a meeting hall. I also learned that like Ireland the postmen in this area have to know which houses are were, as they have many roads called 'Fen Road'. I got very lucky as my sat nav delivered me to the correct hall on the right 'High Street', many are not so lucky in that area. On these longer journeys I now travel with some work. Usually some sort of design project. This time I took a quilt top with me to write up it's pattern. I've found that it is the perfect break for me. I guess it gets my brain working again after just staring at morotway and I stay altert a lot longer after the break. Of course the real bonus is I get to make use of otherwise wasted time. I would have to add the measuring large quilts is a car is a challenge, especially when the car is full to the roof with quilts for my talk. It does mean I have another pattern nearly ready for typesetting and testing. I haven't been able to work much on the Phoenix and Dragon quilt patterns recently. They are taking a lot more work than the pieced quilts. I am having to consider new (to me at least) ways of presenting the pattern pieces, and how to describe what I do. It's funny vbut the more familiar I am with the technique the harder I find it to describe to other people. On the other hand. If I can get these two figured out it should give me an insight into how to produce a pattern for "Where is the north star?" an often requested pattern despite my best efforts to put people off. It really was a pain to put together. On the other hand for people used to doing hand work or any block with inset/partial seamsI guess it wouldn't seem so bad. It's been great to have a day at home today to get some quilting done. I really do miss it when I can't do it for a few days. I've finished one customer quilt and just loaded up another. I am very fortunate at the moment. I have a large stack of quilts I am really looking forward to. It always helps things go quicker, if I am enjoying the quilt. On that note I suppose I should get back to the frame and stop messing about on the computer shouldn't I.
I believe in copyright. I don't copy films, books or music but this really speaks to me. I can't tell you how sick I am of all the copyright junk at the beginning of DVD's. I too have screamed at the TV, "but I DID pay for this movie". The same goes for some of the excessive copyright notices I have found on quilting products. I am a designer and I love to support others, but come on be fair. If you tell me something I already know, why shouldn't I carry on teaching it? What constitutes one use of a panto and why should I be bound by a clause I cound't read before I bought the product. How about we all play nice and get treated like decent human beings. 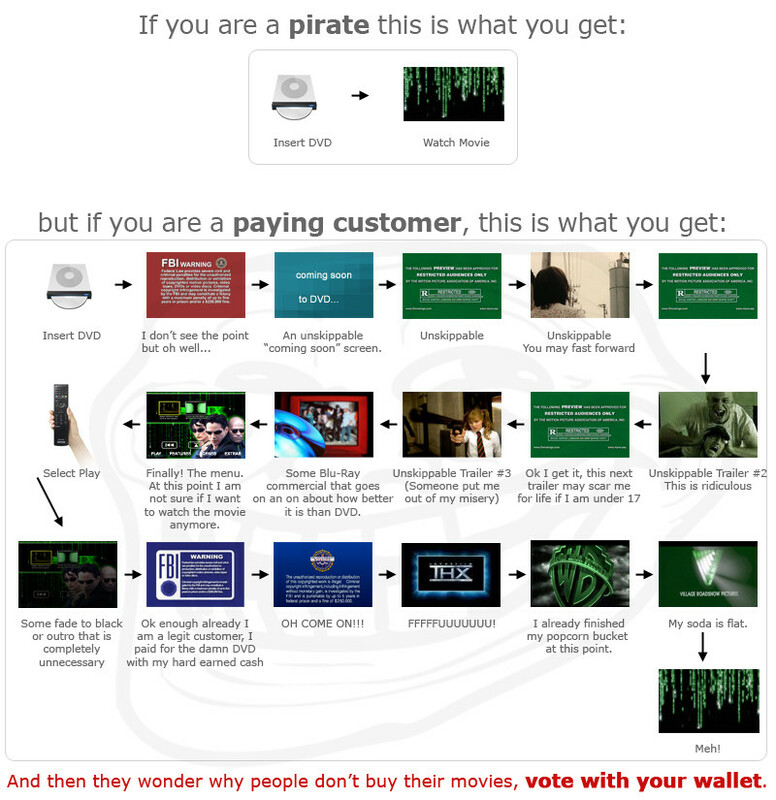 If not I can see the 'vote with your wallet' argument becoming very persuasive. Sorry I didn't blog last night but by the time I had got home and dealt with the urgent business stuff it really was bed time. I had meant to look up the name of the ship as my Irish expert sent it to me, but I didn't so keep an eye on the comments. I just thought it was pretty and worth sharing again. On Monday we plotted a route to take in all the most commonly suggested sights. We started at Dublinea. We had planned to start with Christ Church but if you do it the other way around you get to walk over the enclosed bridge which I fancied. Dublinea is currently undergoing a lot of work but the Viking section is not being worked on. I thought it was a neat little museum and the information was put across well. There are lots of interactive sections which I always like. The best feature was probably the tower though. I do like my towers. This one has an awful lot of stairs. It's a modern square spiral, which makes it easier to climb in my opinion. From the top you get a panoramic view of the city. It is quite impressive. I love the backdrop of hills to one side. I think it is also the best view you can get of Christ Church. I was very pleased we came through the bridge. It has lovely stained glass windows. I think they may well inspire some new quilting patterns. The cathederal is also a great source of quilting inspiration. The floor is fantastic. I don't know if I managed photograph all the tiles, but I certainly tried. The columns were very pretty. I also like the higher windows, they have lovely shapes. Pillar wise I have been spoilt recently by Prague. I think I might be on pillar overload. This is one of the few cathederals I have visited where there is good access to the crypt. I am a huge fan or crypts. This one has a tomb with an iceburg on it. It looks amazingly modern and yet isn't. There were also costumes there from the series the Tudors down there as some of the scenes were filmed in the cathederal. The crypt was used for tavern scenes and torture chambers. 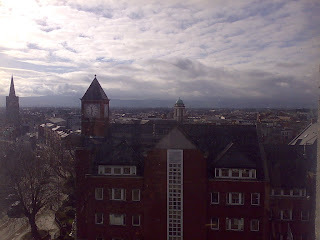 From here we headed down the hill to Dublin castle. As we didn't want to wait for a guided tour we only looked around the chaple. I say only, but boy it's good. I hope I might be able to post a panorama of it, but as I used my phone I have no idea how well it will come out. It had the most amazing ceiling. I really hope my pictures come out well. The camera ran out of battery so we were relying on my phone. I think I liked it more than the cathederal. The ceiling was just like nothing I've seen before. By the time we had pulled ourselves away from the chapel lunch was overdue. I wanted to get steak and chips. We quickly worked out that the tourist area is not the place to buy lunch. On the advice of some very nice Garda (I am told they are all very polite and helpful, I tend to believe) we ended up in Flannigans opposite the spike (I like it, sorry). It claims a warm Irish welcome, which I am not convinced it had. Mostly overworked really. However the food was very good and when there were problems they were dealt with quickly and politely. Price wise, it was about equivelent to London but the quality was much better. Irish cow is very nice. In fact all the meat we had was good. I was particularly liked the sundae. On the whole I don't like either chocolate or strawberry ice cream but these tasted exactly like astronaut ice cream. It was very odd having cold wet ice cream that tasted like the freeze dried stuff. After lunch we headed for Trinity college. I hadn't wanted to pay 9 Euros to see the book of the Kells. Then I found out that it also gave us access to the long library. I am so glad it does, as actually the book of Kells was lovely. I hadn't appreciated the level of detail it had in it. They also have a fascinating video on bookbinding. I really want to have a go at it now. I wish it had been available as a dvd. The long library though was the most amazing place. So many books, and such beautiful architecture. I wish I could have stayed there longer, but there was a flight that I really had to get. The good news was there was no waiting around at the airport. The bad news was they had brought our flight forward an hour and we only just made it. On the whole BMI was very good to fly with. They did move the flight times a lot, and their in flight exchange rate is robbery, but they were great for luggage regulations. So that's your lot for now on Ireland. I will see if I can upload some more images if I get some time at home. I really loved this trip. I can't wait to come back. It also reminded me I need to get a plan to go to Scotland again too. The course is over and we've had to leave. I am very sorry to have only had such a short time there. The people, place and food were all amazing. I really hope I will get to come back and see some of the quilters again. Having longer to work on the art quilts meant that every one has gone home with an almost completed wall hanging. It was nice just to see the projects through that far. After the course we were delivered to Dublin by one of the organizers (did I mention how helpful everyone was?) and dropped at the door of our hotel. 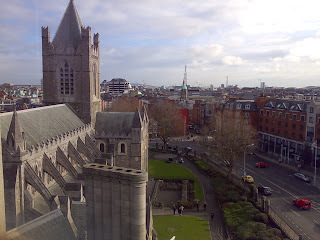 We figured we would have a day to look around Dublin, especially as it made the flight cheaper. As we have very limited time, we went to start exploring straight away. 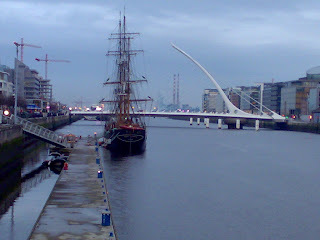 We walked down to the O'Connell then along the river towards the harbour. 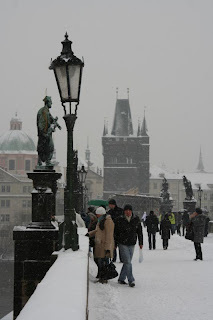 It was a nice quiet walk as it took us away from the main shopping and tourist area. 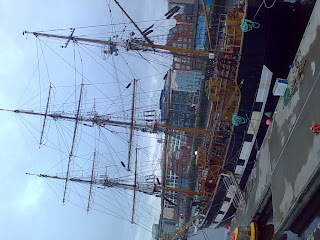 It also gave a chance to look at several bridges and a ship. I cannot believe how much I have eaten. It seems that food is the way to a quilters heart. Personally I think I am more swayed by the hugely helpful staff. Nothing has been a problem for anyone. I did forget a few things last night, it had been a long day. Firstly the flight over was great. London was grey and yucky, but Wales had perfect weather. Lots of lovely cloud formations. As we approached Ireland the clouds closed in again and I thought I would miss out on seeing the countryside. We decended through the top layer of cloud and underneath were the most beautiful small clouds. The sky where you could see it was stripy and the ground patchwork greens. Definately the way to impress a visitor. As I said yesterday we arrived in time for lunch and then had a couple hours of free time. We were advised to have a look at the beach. It is lovely I don't know if the picture will come close to doing it justice but, I've tried. The tide was a long way out and you have to go and see the sea don't you, when it's that close. I did get rather wet feet crossing the sand, and although it is warmer here than in London, it isn't really paddling weather. It turns out Ireland is the same time zone as the UK, phew! I made it to breakfast on time and then to my class. They are a very keen bunch and have made great progress. We have been doing art quilts by numbers, but with the added bonus of of a couple of laptops and a printer. This allowed us to work with students own pictures. A little stressful, but a lot of fun. As you can see everyone worked hard, this was actually some time after the class finished! Several students couldn't bear to stop quilting, which is just great by me. I am now watching the show and tell. Any minute now we will get to the nearly complete projects from the class. After that the raffle, then back to the bar. 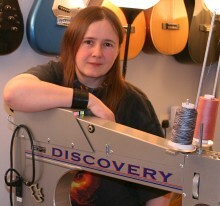 Oh did I not mention, they have a lovely bar here and quilter enjoy making use of it while catching up with friends. Hopefully tomorrow morning most of them will get their quilts finished, I'll try and get pictures. It's been a long day, but I think most of the tired muscles are from laughing rather than any of the other exertions. Warm welcome wouldn't cover it, I feel more like I've just run into a lot of long lost friends. I expected Ireland to be similare to Scotland, and it kinda is, but it's also very different. Flying in it is clear there is a lot of space here. People are well spread out which I like. The building we are staying in is amazing. Yes, it's the one in the picture. It is stunning inside and out and just like Scotland people just can't help enough. Driving here the country feels very different. It does feel more European. I can't really put my finger on why, you'll just have to believe me that it does. After a late but very welcome lunch we walked down to the beach. 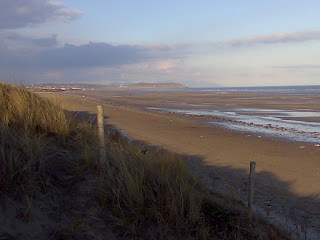 There is a right of way that takes you across a golf course and then through the dunes to the sea. Having grown up in Sussex I m used to shingle beaches. The expanse of sand was quite amazing. I got back in time tovisit the traders before an excellent dinner. Just as well the airport only weight the bags, I suspect we are going to be heavier on the way home. I have got to be very careful what I buy as the cases were absolutely full of quilts so I can only add to hand luggage. I was the after dinner entertainment. I rather like eating before a talk, it's much more relaxed somehow. I had been a little concerned that the talk would be too short as I had less quilts, or that more of my audience would fall asleep because I had to talk without props for some of it. Apparently not just over an hour and the crowd seemed happy. I can't quite believe I can now stand up and just talk in front of a crowd. I never thought it was something I would do. Tomorrow I start my class. We will be doing 'Art quilts by numbers'. It should be fun especially as we have access to a computer and a printer so some students can work on their own images. Having just set an alarm I am now wondering. Is Ireland on the same time as the UK? This could get exciting. Isn't a PA supposed to save work? I've realised I have no choice. I have too much paperwork to handle on my own. I've known for a while this was coming. My desk is constantly covered in paper which needs attention and do you think I can find the bits I am looking for? How about get the desk clear to design patterns or work on the book? No not a chance. So after getting multiple offeres of help in a week I took the hint. I am now looking forward to a less cluttered desk (and full of much more interesting clutter I hope). However to get to this point I've got to do rather a lot of planning. You see all the questions I answer regularly now have to be written down and the correct answers recorded. All the files I use need to be shared somehow and kept up to date. Email, phones calls and letters need moving around. It seemed simple until I really looked at the problem, now it just keeps growing. Fortunately I did have one offer of help from someone I see regularly so tranfering paper is fairly simple, but data and knowledge are another matter. It's one of those scary and yet exciting projects. Whilst I haven't been doing as much writing as I would have liked recently I do have several patterns in various stages of completion now. I am also making painfully slow progress on my book on art quilts. It is going to cover a lot of the different techniques I use when making my art quilts. I am also writing up severl step by step projects for it as well. So hopefully it will be simple enough for anyone to produce a work of art but also provide some useful tools for more experienced quilters. Who knows it might just work. Oh and yes I will be getting lots of pictures of my art quilts to go in it too. Hopefully once I shift the more mundane work I will be able to make more progress on this. My secrect squirel project for the Festival of Quilts hasn't made much tangible progress this week, but I did meet a lady who helped me with a concern I had. I just happened to be teaching next to exactly the expert I needed at the weekend. How cool is that? I found out that my quick and dirty solution really won't work, which to be honest I had guessed. However the slightly longer and only grubby solution will. That means I have a firm plan for at least one part of the project. It may not sound like much but I feel a lot better for it. I suppose I had better get back to sorting and packing paperwork. Dull dull dull. On the other hand it is saving me from a quilt which doesn't want to play nice, so I should be grateful really. Hmm, and sorry if this post is full of spelling errors, the new blogger editor doesn't seem to have a spell checker. Over the weekend I was teaching in Nottingham. 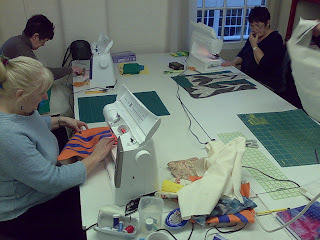 I was really impressed with myself as I remembered to photograph a class and I blogged it. However the post hasn't appeared :(. Having just tried resending it, it still hasn't turned up. Can I just say to any of my students looking for the post. I did do it really I did and I will keep trying to find a way to get it up. With a bit of jiggery pokery I've got the post up. The Sunday class went well too, but I did discover that twice the students is easily twice the effort. I've never had the chance to test the theory with two classes so close to each other before. Now I have I'm sure. It was fun but boy an I tired today. Teaching is one of those jobs where you don't always feel like you are working while you are doing it (sometimes you really do) but you always find out later how much effort you were putting in. I am terrible at asking to take pictures in classes. I usually remember just after everyone leaves. Today I remembered just before they left. I think that worked really well as you can see the project well underway. 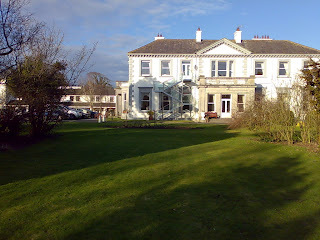 The class was at The Huskvarna Studio in Nottingham. It's the first time I've been here and I did struggle to find it. Can we just say one way system with tram and bus lanes. When you do find it the workshops are very impressive. Space for two large practical classes and a computer lab as well. Today the students were making caveman style tulips. This is a Ricky Tims technique. No templates, no rulers and very few rules. It's a very free form project where most 'design oportunities' can be worked in seamlessly. It's the second time this week I've taught this class. It's been fun both times. With a group who are prepared to try something different it can be very inspiring for me too. Hopefully some of my students from both classes will send in photographs of their finished projects so I can put them up on my web site. I enjoyed today I hope you all did too. Looking forward to tomorrow. We've all heard about the improvements in technology but I'm not entirely convinced. Once upon a time hard drives were expensive. I mean really expensive but they lasted. Now I seem to need a new hard drive every few months. It's not the end of the world we do have backups and we mirror the data, but it is annoying. Just having to get another drive and install it takes time. If this is improvement I can do without it. I would also like companies to stop improving their soups. Apparently some regulationg body has declared that foods should have less fat and salt in them. In principle I agree. However when you take the cream and salt out of cream of something soups they really loose they character. Maybe it is a drive to bankrupt these companies and make us cook more. If I thought it would get people creating in the kitchen I guess I could live with it, but honestly I think people will just choose cheaper and less healthy foods. I love my quilts traveling but it is nerve wracking. I find it very hard to get my quilts properly insured while they are in transit. Several times I have wondered if I should stop entering US shows because of it. I found out last night that Phoenix Rising has made it into the Lancaster County show. I am thrilled, but my heart sank when I looked at their shipping instructions. Another uninsured round trip coming up. I emailed them to explain the problem I have with this and why the insurance sold by the courier companies wasn't worth paying for. Usually (if I even get an answer) it is of the lines, "you entered you have to abide by the guide or you can spend a lot of money doing it this way". Not this time. I got a very well thought out response. They explained how they look after the quilts, how they insure them while the quilts are at the show, and most importantly that they have found a way to insure them on their return journey! How cool is that? They had already found out that couriers will charge you for insurance that won't work and found a way around it. They are also looking in to the possibility of offering insurance for quilts being shipped to the show. I really can't express how impressed I am with the attitude and the speed with which they got in touch. I feel so much better sending my quilts out when I know they are going to such a professional, thoughtful and responsive organization. Well done AQS. Maybe if they find the solution to all the shipping problems other show organizers will follow their example. I can hope. Do you remember I mentioned the new quilt pattern? Well I got the top back on Tuesday and I am thrilled with it. I am assured it was a lot of fun to put together and was quick to make as well. I am really looking forward to quilting it, but it will have to wait it's turn. I may also put on a border before I do that. I haven't decided yet. I suppose that is the bright side of it sitting in my quilting queue, I have time to decide. Once I have the pattern ready I will put it up here so you can see the quilt. I've been wanting to do this for days but life has kept getting in the way. I find it does that, but when it is paying work it is hard to turn it down. Lots of customer quilts are ready to return home, and I am feeling better for having cleared some of the pile. I think they start to intimidate me after a while. 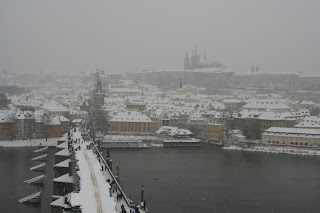 If you remember in my last post on Prague, the night we landed it was clear. Cold but no snow. The whole reason for the visit was to find snow and I was really hoping the forecast was going to be right, 3 days or heavy snow. Well it was in a way. I don't know what heavy snow is like where you are, but here is tends to be very large lumps falling from the sky and being blown about a lot. 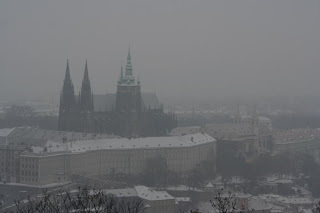 In Prague it's just constant small flakes falling. It doesn't really look like much until you look at the floor and see how much it has built up. 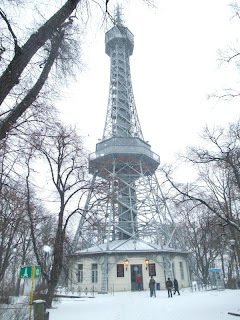 Waking up to snow was great, and it decided our first tourist stop, Petrin Tower. The tower was inspired by the Eiffel tower, but is somewhat smaller (60m). It is still 229 steps to the top. I wanted us to get to the top of it as soon as possible so there would be some view before the snow obscured everything. 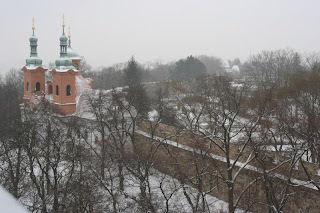 You also get a great view of Pragues great wall from the Petrin tower. The Hunger Wall was built for the first time in the 14th century. It was intended as a fortification for the Lesser Town and Castle. It is said that the wall was built as a make work project. There was a famine and the poor of the city could earn food by building the wall. Depending on which report you read people seem to either believe it was defensive and probably didn't help the poor muc h, or that it was useless as a fortification and was only a social project. Sorry I haven't done enough research to have an opinion. I just know it's impressive. 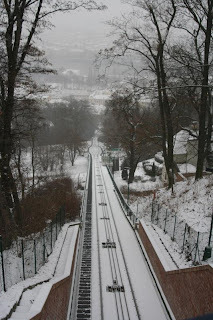 To get up and down Petrin hill we took the Funicular railway. I have a huge soft spot for them and I took dozens of pictures last time. This time we decided to walk a little way down the hill to a bridge over the railway. It was well worth the walk. I love the view between the trees of the railway and in the distance the town. I think you can probably see the river and then across the river the main part of the town. After taking the railway back down the hill we had lunch at a local restaurant. It was one of the best means for me. I loved the garlic soup and it was only 1.50! That is just amazing value. Refuled it was time to head for our next tower. 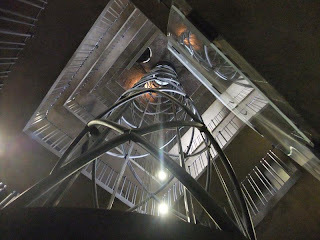 This tower doesn't need long sight lines to appreciate it, as the best view is right below it. Well technically part of it. 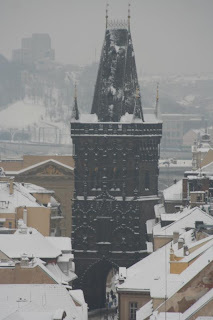 The tower I am talking about is the Charles Bridge tower. I love the solidity of this tower. It feels safe and stron g. It also has rooms in it with the most amazing ceiling I also find it's stairs a lot more comfortable, they are a square spiral. It works surprisingly well. 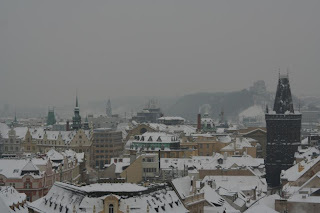 When you pay for access to these towers you often have access to the roof, and this one is especially magical in the snow. You can peer through arches in the wall around the roof and look down on the tourists on the bridge. Again you get a good view of the castle across the river. At the other end of the bridge is another tower, which I really must climb next time, and behind that is the church tower we climbed on our last day. As you can see maintaining the bridge When I was last there 2 years ago they were working at the other end of the bridge I assume they have been working their way along the bridge since the. It's a huge project as they are taking They have also replaced pieces of the statues plinth. All this without shutting the bridge. I'm impressed, and you will just have to forgive scaffolding. From here we moved on to another tower. Yes if I can climb a tower I will. I love being high The astronomical clock tower doesn't quite work for me, especially as to access the tower you have to go through a modern building. It just doesn't feel right. However it can be accessed by two lifts which was a lovely r I also think the second lift it beautiful. I am amazed they thought to put something so modern into a historical building but it works. The lift in in the center of a massive spiral slope. I am sure this is going to turn into a quilt. I'm not sure how, but the shapes are too much fun not to do something with them. 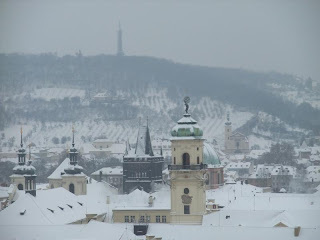 The tower does also give a good view of the church of our Lady before the Tyn. 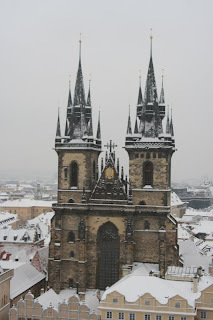 It's fabulous towers can be seen poking up beyond the other buildings in the old town square from the ground but then you climb the The tyn towers are further proof (if you needed it) that Prague got a great deal on gothic architecture. Having just checked on it's correct name it sounds as though a visit to the inside of this church is called for on our next visit.Apparently it's interior is particularly fine. That has to be worth seeing, as their more ordinary buildings are utterly stunning. The last picture for tonight is another The Powder tower. We went up this one too but it will have to wait for another day. I've got another busy day tomorrow. Two more classes, and that means another early start. It's funny what inspires me to really get a lot of work done. The most effective is knowing other people are working on my things too. Last Thursday I handed over a pattern sample to one of my students top put together. She had nearly finished it on Friday! She also seemed to have enjoyed it. So I felt I should get it's brother pattern written too. Being a bit more complex I wanted to be able to give her a bit more info with this one. Saturday evening I came home to find another of my patterns had gone into testing. This also encouraged me to write (and I have two new ideas to get on with as well). I now have two more patterns ready for type setting and another two well on the way. The Phoenix pattern in in progress but we are still debating ways to provide the pattern. We will come up with a solution I just don't know when. 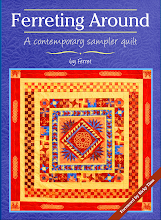 As well as the writing I have managed to finish several customer quilts. It's a good feeling to be catching up. I've got to. I have a lot planned for shows this year and I will need the frame for my work too. I am trying to get in the habit of booking my slots in the stack the same as customers. I'll let you know how that goes.